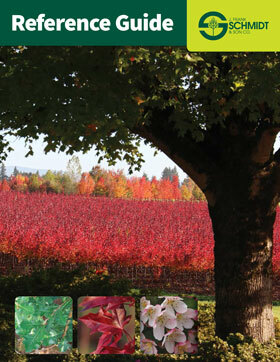 Brimming with colorful photos, informative descriptions and accurate drawings that depict mature size and form, our Tree Reference Guide illustrates more than 400 of the species and cultivars that we grow and ship to nurseries and landscape projects across North America. An invaluable reference found on designers’ and specifiers bookshelves for more than 30 years, we are now pleased to offer it online as well as in print. Click below to download our Tree Reference Guide and learn about hundreds of tried and true as well as brand new trees. Many are widely available at nurseries nationwide. The above download is in PDF format and requires Adobe Reader. If you do not have it installed, click on the following link to download your free copy. We publlish our Reference Guide every 3-4 years, depending on its rate of distribution. This edition was just released in January of 2018. We will add many extraordinary trees to our product line in the future. These will be featured in our annual New Trees Brochure, which you may download here. Looking for a tree that is no longer listed in this edition of the Reference Guide? Click here to download the previous (2014) edition.